Would you like to automatically set captions as image filenames? With Envira you can do this simply by creating a custom plugin. We’ll walk you through the steps on how to set captions as image filenames automatically. This tutorial is a bit more technical than our other docs, but we’ll walk you through the process step by step. 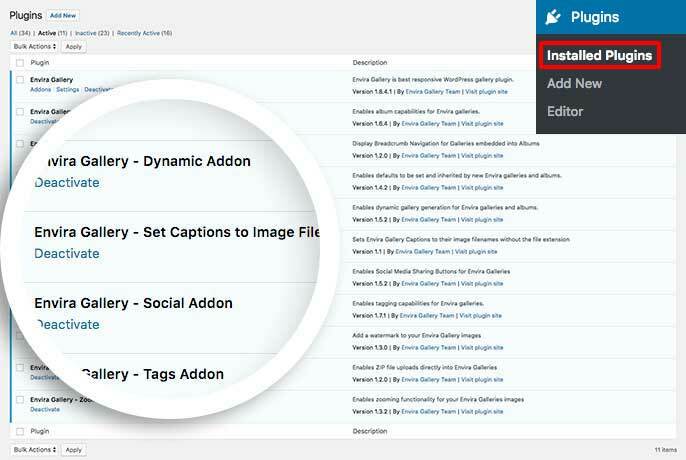 In order to set captions as image filenames automatically, we’ll need to create and upload a basic WordPress plugin. Why isn’t the filename showing in my caption when I edit the image? To automatically set captions as image filenames, just add the following code to a new file at wp-content/plugins/envira-set-caption-image-file.php. The referenced code above will automatically set your filename as the image caption but remove the file extension. Your next step is to activate the plugin you just uploaded. Simply navigate to the Plugins from within your WordPress dashboard and activate the Envira Gallery – Set Captions to Image Filenames plugin. Q: Why isn’t the filename showing in my caption when I edit the image? A: Envira won’t update your database entry for the caption but when you enable captions to show under the image or in the lightbox, this plugin will automatically pull that filename for your image caption.